(10.02.2010) FORT HOOD, Texas – Sergeant Travis Bishop received word this week that he was given a 3 month suspension of the 12 month sentence he got last year for refusing to deploy to Afghanistan based on his Christian religious beliefs against war. Sgt. Bishop has been imprisoned at the Fort Lewis, Washington stockade since August 16, 2009. Lt. General Robert Cone, commanding general of Fort Hood approved the sentence reduction on February 4th after considering Sgt. Bishop’s clemency application. Sgt. Bishop’s clemency application included a legal brief (alleging problems at trial, problems with the processing of Bishop’s conscientious objector claim, and mistreatment at the Fort Lewis brig), a hand-written letter from Sgt. Bishop, and 433 letters (signed by a total of 538 people from 21 different countries) from members of Amnesty International calling for Sgt. Bishop to be released. Sgt. Bishop’s civilian attorney, James M. Branum, estimates that Sgt. Bishop will be released no later than March 31 based on the amount of good behavior credit Sgt. Bishop has earned. Sgt. Bishop went on to say that his plans after release are to see his family and friends and then “to try to start this new life that I’ve been granted. I think it is safe to say my life has been completely changed by this. I won’t be going to what my life was like before. Lots of changes are in store for me.” Sgt. Bishop said he hopes to continue to speak out against war and will be returning to Texas to pursue a career as a country musician. Sgt. Bishop also said he had no regrets and that he urges others who are feeling moral conflicts with war to follow their conscience, but to not wait as long as he did to get help. 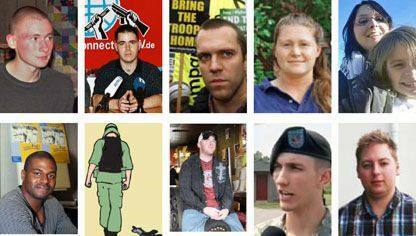 (31.03.2010) Courage to Resist: USA: Afghanistan war resister Travis Bishop is free!